Parents love a school league table, particularly when it shows their child’s school in a good light. However, I am rather confused by the way the school league tables in Ireland are currently devised by a media eager to draw comparisons. Schools that send all their leavers to Irish universities get 100% (or even higher by an anomaly that I don’t understand), while schools such as ourselves, that think it is a good thing to encourage leavers to look around at universities in the UK, Europe and the USA, end up in 500th place, because, although every leaver goes on to third level education, only a third of them stay in Ireland, despite two thirds being from the island. Since when has having a narrow world view been a mark of excellence, particularly in a country with such a huge diaspora? 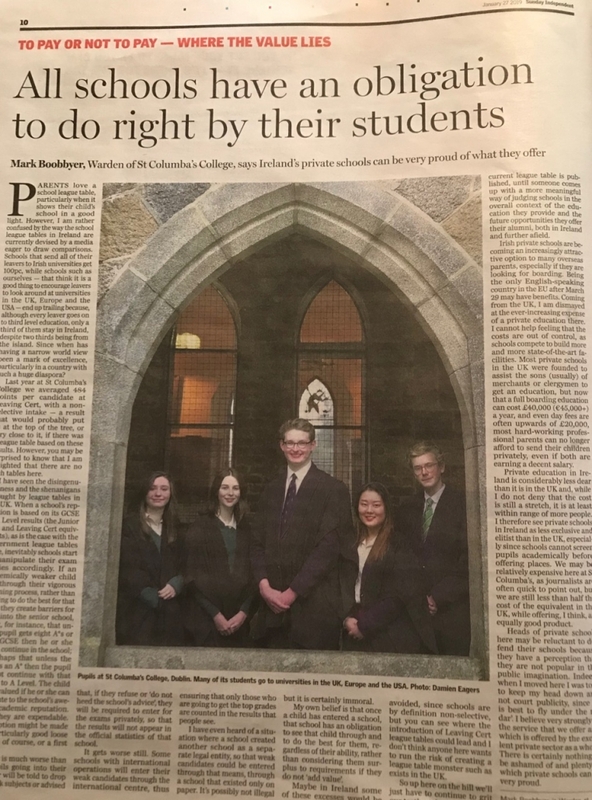 Last year here at St. Columba’s College we averaged 484 points per candidate at Leaving Cert, with a non-selective intake, a result that would probably put us at the top of the tree, or very close to it, if there were a league table based on these results. However, you may be surprised to know that I am delighted that there are no such tables here in Ireland. I have seen the disingenuousness and the shenanigans wrought by league tables in the UK. When a school’s reputation is based on its GCSE or A Level results, as is the case with the government league tables over there, inevitably schools start to manipulate their exam entries accordingly. If an academically weaker child gets through their vigorous screening process, rather than deciding to do the best for that child, they create barriers for entry into the senior school, saying, for instance, that unless a pupil gets 8 A*’s or A’s at GCSE then he or she cannot continue in the school, or perhaps that unless the GCSE is an A* then the pupil may not continue with that subject to A Level. The child is only valued if he or she can contribute to the school’s awesome academic reputation. If not they are expendable. An exception might be made for a particularly good loose forward, of course, or a first violin. Maybe in Ireland some of these excesses would be avoided, since schools are by definition non-selective, but you can see where the introduction of Leaving Cert league tables could lead and I don’t think anyone here wants to run the risk of creating a league table monster such as exists in the UK. So up here on the hill we’ll just have to continue to grit our teeth each year when the current league table is published, until someone comes up with a moremeaningful way of judging schools in the overall context of the education they provide and the future opportunities they offer their alumni, both in Ireland and further afield. Irish private schools are becoming an increasingly attractive option to many overseas parents, especially if they are looking for boarding. Being the only English speaking country in the EU after March 29thmay have benefits. Coming from the UK I am dismayed at the ever-increasing expense of a private education there and I cannot help feeling that the costs are out of control, as schools compete to build more and more state of the art facilities. Most private schools in the UK were founded to assist the sons (usually) of merchants or clergymen to get an education, but now that a full boarding education can cost £40,000 (45,000+ euros) a year, and even day fees are often upwards of £20,000, most hard-working professional parents can no longer afford to send their children privately, even if both are earning a decent salary. Private education in Ireland is considerably less dear than it is in the UK and, while I do not deny that the cost is still a stretch, it is at least within range of more people. I therefore see private schools in Ireland as less exclusive and elitist than in the UK, especially since schools cannot screen pupils academically before offering places. We may be relatively expensive here at St. Columba’s, as journalists are often quick to point out, but we are still less than half the cost of the equivalent in the UK, while offering, I think, an equally good product. Heads of private schools here may be reluctant to defend their schools because they have a perception that they are not popular in the public imagination.Indeed, when I moved here I was told to keep my head down and not court publicity, since ‘it is best to fly under the radar’. I don’t really subscribe to that approach because I believe very strongly in the service that we offer and which is offered by the excellent private sector as a whole. There will always be naysayers but there is certainly nothing to be ashamed of and plenty of which private schools can be very proud.